Sky Cycles public art project by Catherine Widgery. 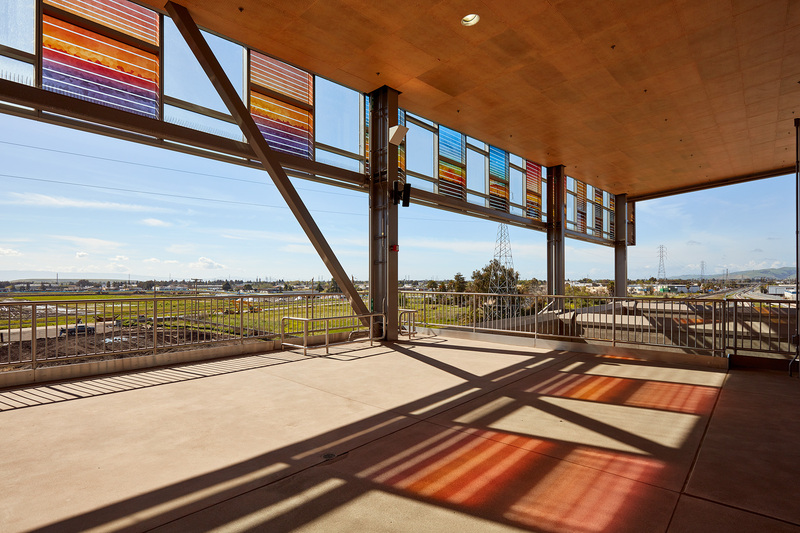 Installed at the Warm Springs BART station in Fremont, CA. 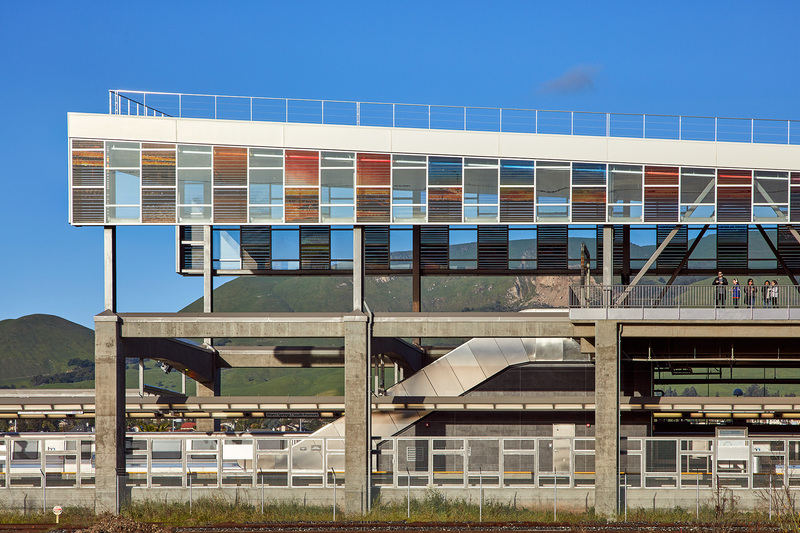 BART (Bay Area Rapid Transit) wanted to make a definitive architectural statement when they commissioned the Warm Springs Station. It may seemingly sit in the middle of a bean field, but that won't be the case for long. 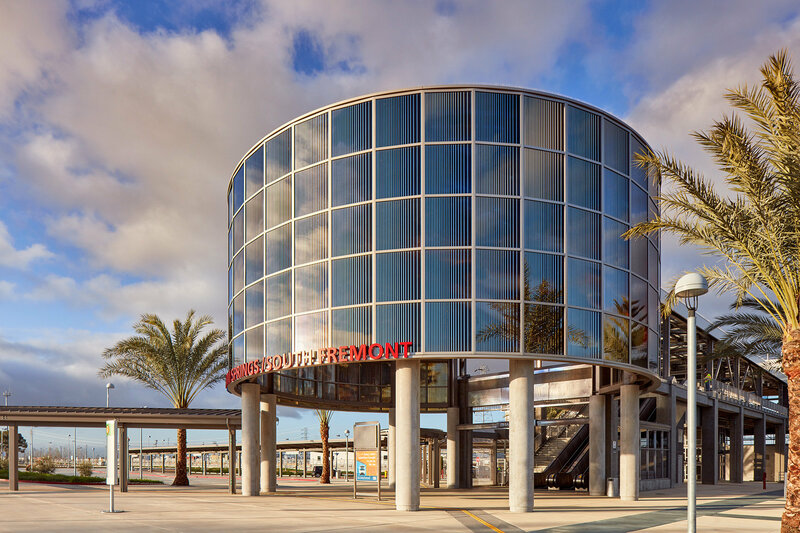 Right now, Warm Springs in Fremont is the end of the transit systems line and BART wanted to make it an elegant terminus. Robin Chiang & Company won the architectural design competition and our client, the internationally acclaimed artist, Catherine Widgery, won the competition to create all the environmental art at the station. Most of Widgery's projects are large in scale and many use glass in some innovative way. The last project we did for her were a set of illuminated glass murals 40 feet high and over two hundred feet long that adorned and upscale mall in Canadas capital. Chiang's original design was a gigantic glass funnel that served as the entrance. The funnel morphed into a forty foot glass drum which became Widgery's primary canvas. Most of Widgery's work exploits the dualities of materials, and "Sky Cycles" at Warm Springs is no exception. 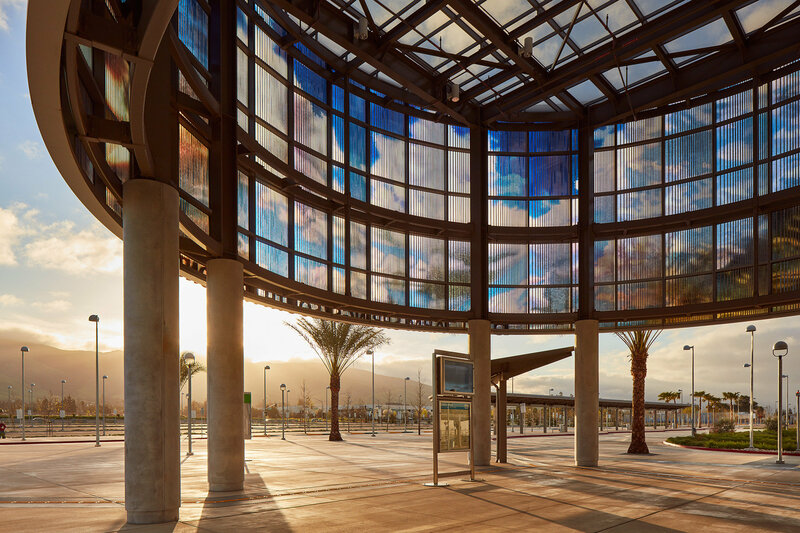 The BART station rotunda is both a mirror and a stained glass painting of the skies and hills that surround the station. The artwork is kiln fired on each panel of glass and is permanent. The alternating bands in the rotunda panels are made of a reflective/transparent material. Sometimes there is reflection and sometimes we see through these vertical bands between the painted sky, depending on where the light is greater. The effect is subtle and it may take the average commuter many trips through the station before they see the effect, but it is all part of the design. Big art helps make a small station a big deal. Engine No. 11, an Oshkosh 8X8 Striker, has a 630 gallon tank on board filled with fire-fighting foam. 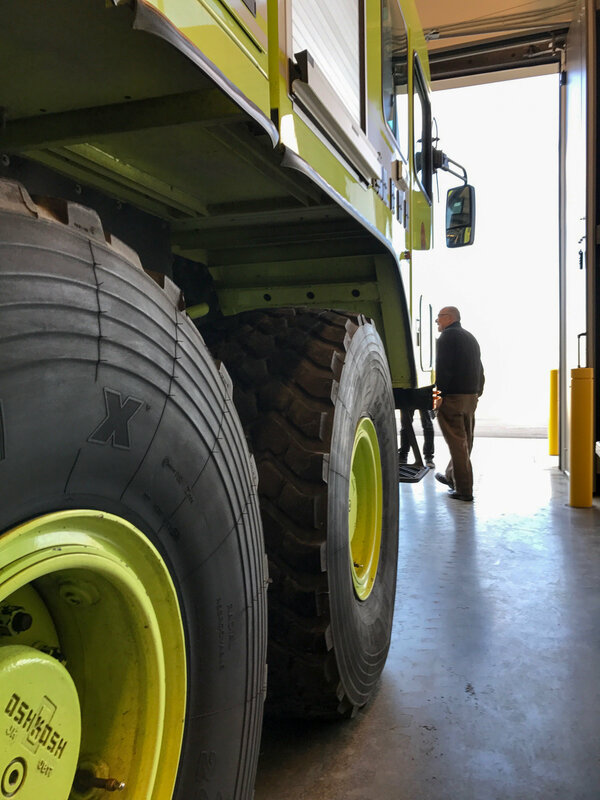 What do you do with a couple of fire engines that are the size of two Greyhound buses, have tires four feet high and can unload 630 gallons of foam in 60 seconds? You build a place to park and service them close to an airport runway so that they can be ready to go in a split second. SFO is a busy place, the fourth busiest airport in the United States. Close to 400,000 planes a year take off and land and over 50 million people embark or disembark annually from the airport. 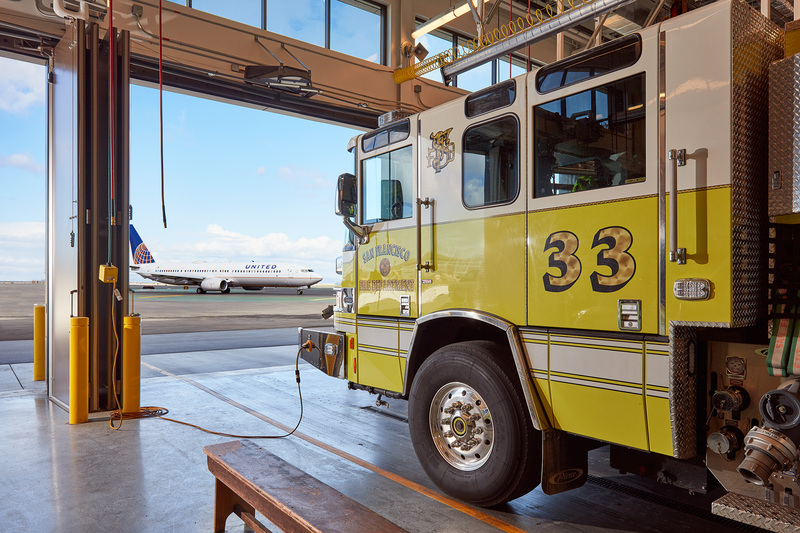 That is enough traffic for the airport to support three fire stations housing eighteen pieces of apparatus and a 24/7 crew of firefighters trained to handle any emergency, from an onboard medical situation to a full-scale runway conflagration. Fighting airplane fires is very specialized and the equipment used is the same. 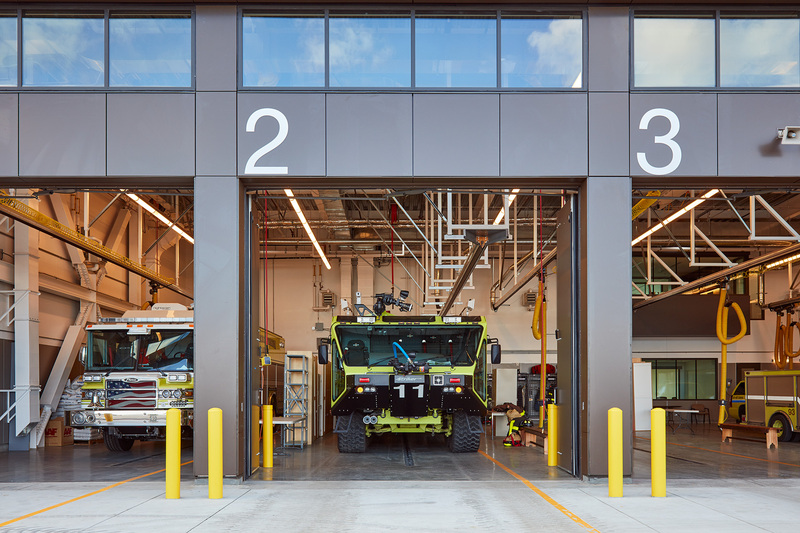 FireHouse 3, designed by Shah Kawasaki Architects of Oakland in joint venture with YAMAMAR Design, is much more than a garage for oversized fire fighting apparatus. 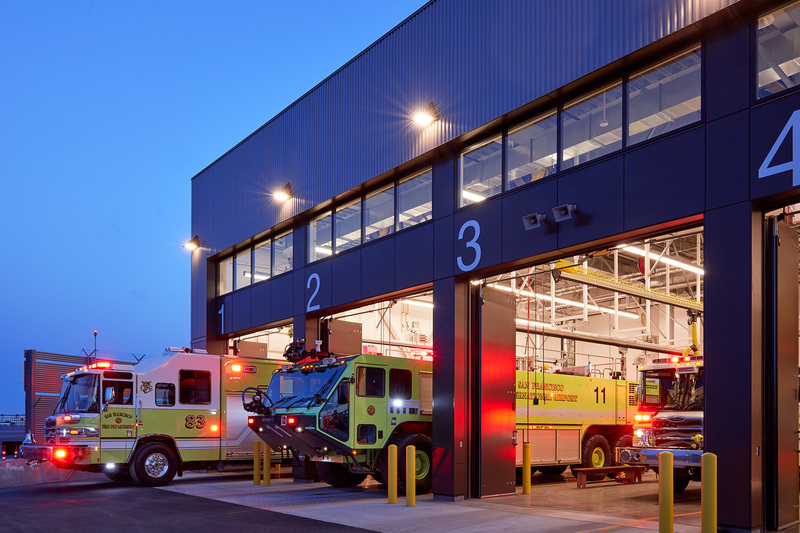 It is a firehouse designed for the very specific needs of airport fire safety. 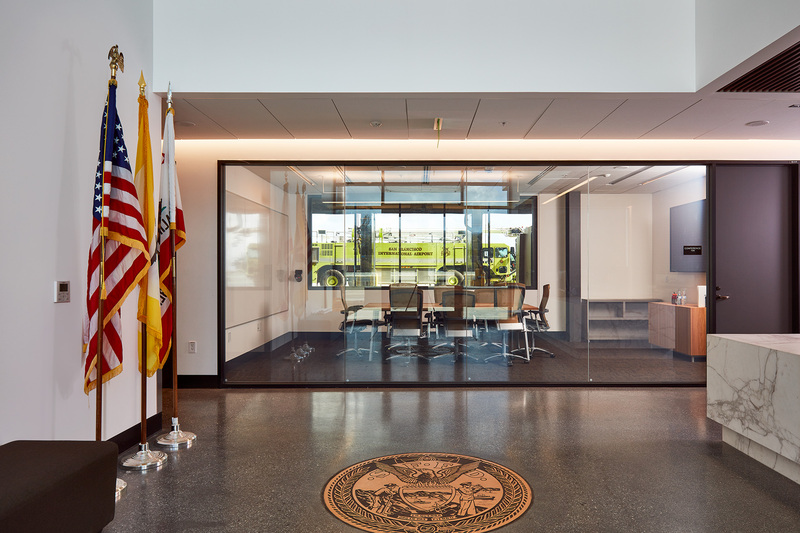 Among its unique features, the building has a command center with a panoramic view of both runways. It also has its own foam fill delivery system with a 1600 gallon tank, and an oxygen tank fill station. The building's windows are triple glazed to absorb the runway roar just yards from its bays. And there's a special HVAC system to filter out jet exhaust. FireHouse 3 is a big house to handle big emergencies. FireHouse 3, at San Francisco International Airport.